The Sirtuin-3 gene is known as a mitochondrial gene. There are a few hundred mitochondria in living cells. They produce cellular energy in the form of adenotriphosphate (ATP). 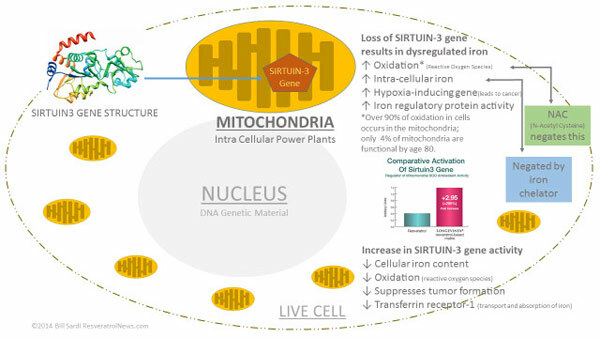 By virtue of its ability to control iron the Sirtuin-3 gene reduces oxidation, suppresses tumor growth and helps to renew old mitochondria in a process called mitogenesis. To prove their experiment researchers removed the Sirtuin-3 gene from living cells. They observed an increase in cellular iron and oxidation. The increased oxidation could be completely negated by a strong antioxidant (N-acetyl cysteine). Elevated intracellular iron levels were negated by the use of iron chelators (key-lay-torz). More than 90% of the oxidation that occurs within living cells occurs within the mitochondria. By age 80 only about 4% of mitochondria are functional. While diets could be developed to enhance Sirtuin-3 gene activity researchers lament that Western dietary habits are from conducive for optimal activation of Sirtuin-3. Calorie restricted diets activate Sirtuin-3 and prolong healthspan and lifespan in laboratory animals but may be impractical. Researchers are calling for molecular mimics that activate Sirtuin-3 to promote healthy aging.